Payment for service is required after you see the dentist and a treatment plan is approved based on your clinical needs. This practice accepts: Cash, Check with valid ID, Mastercard, Visa, American Express, Discover. Financing is available through CareCreditSM, a Synchrony Bank company. * To pre-qualify for credit, click on the link below and complete their on-line application form. CareCredit’s approval response is provided quickly. Some practices require a minimum treatment fee to use this service. Please contact the practice you would like to visit for more information regarding their specific CareCredit policies. Click here to apply for Care Credit. This practice accepts SC Medicaid, Delta Dental and MetLife. If you have dental insurance through a carrier not accepted at this practice, an appropriate dental walk out statement will be provided so you can file your claim directly with your insurance carrier. Be assured you will save money by filing the claim yourself. 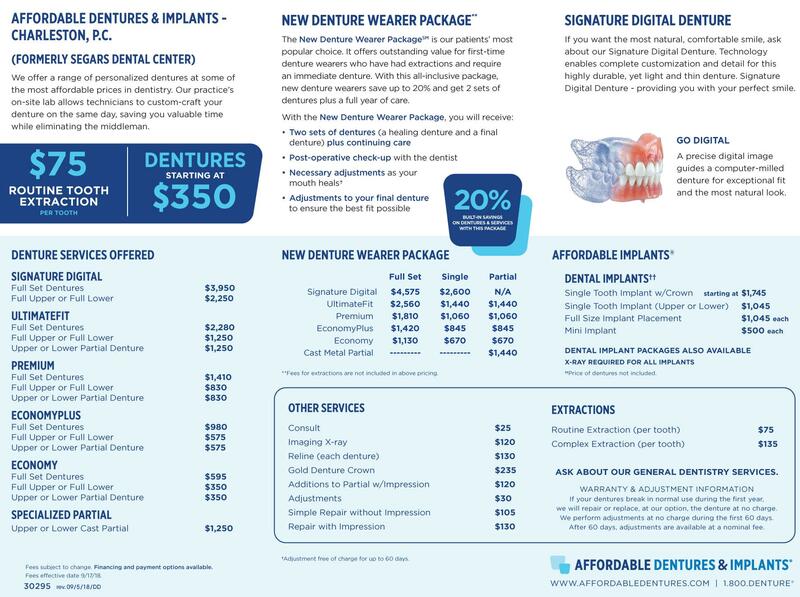 Affordable Dentures fees are so low, the total cost for the services you will receive at this location are likely less than the co-pay you will be required to pay at most other general dentistry practices. The practice staff can help you calculate the costs so you can make the best decision. Please fill out the form below to request an appointment. For immediate assistance, please call us at 843-410-6266.